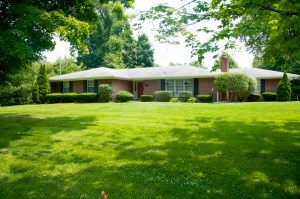 5525 Beth Rd Louisville KY 40219 offers a rare opportunity in Louisville Kentucky. The property includes a stunning five bedroom home on over twenty-six acres! Additional property features include a Guest House, Pond, 3 car Detached Garage, 2 1/2 Car attached Garage, & Outbuildings! The columned front porch entry of the main house opens to a pleasant Living Room with crown molding accent. 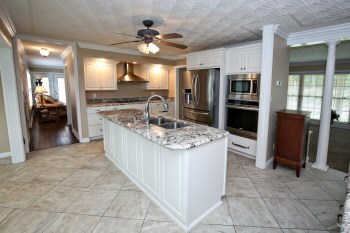 The Eat In Kitchen is large with an island, granite counters, & stainless appliances. The Formal Dining Room features vaulted ceiling. 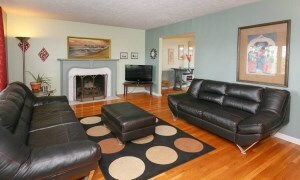 There is a Family Room with brick fireplace & hardwood flooring. The Master Bedroom showcases recessed lighting, double tray ceiling, and walk in closet with built in shelving. The huge Master Bath includes a tiled walk in shower and jacuzzi tub. There are two more Bedrooms on the first level, one with ensuite Laundry. The first floor Full Bath and Laundry complete the main level. Upstairs you'll find two more Bedrooms, 2 Full Baths, and and office. The back deck is peaceful with gazebo overlooking the yard. A pleasant patio is positioned between the main home and a 2085 square foot Guest House. The Guest House includes one bedroom, two full baths, kitchen, office, excercise room with glass surround, and upstairs living room loft. 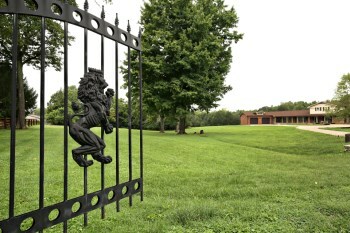 5525 Beth Rd Louisville KY 40219 features an enormous 5,000 sq ft metal outbuilding. The building has been equipped with water, gas, & electric and has black powder coated wrought iron fencing to secure tools. The outbuilding has sixteen foot ceilings with two 14 foot overhead doors as well as 2 attached carports. The loft above the outbuilding has been roughed in for a bath and is completely insulated. A secondary outbuilding offers an additional 414 square feet. This property is truly amazing with incredible acreage highlighted by a pond, creek, and basketball area. Call 502-371-1173 for more information about this incredible property for sale in Louisville, KY.
312 S Beckley Station Rd Louisville Ky 40245 is a lovely two Bedroom Ranch positioned on 1 1/4 acres in Louisville! The home features a cheerful front porch which opens to the Family Room with natural lighting, hardwood flooring, & crown molding. The Kitchen offers granite counters & tile back splash and is connected to the Formal Dining Room with hardwood flooring and access to the back deck. 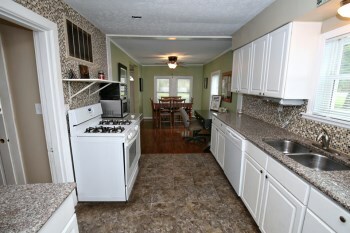 312 S Beckley Station Rd Louisville Ky 40245 has two pleasant bedrooms and a Full Bath with a double vanity. 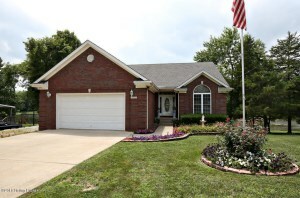 Crystal Lake is a wonderful neighborhood located in La Grange, Ky in Oldham County! The neighborhood is on KY 53 just off I-71 and features many mature trees, natural surroundings, and wildlife. 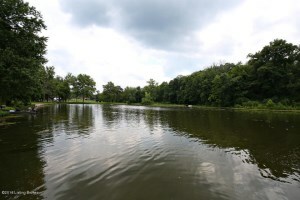 The centerpiece of the neighborhood is an 80 acre lake that is available only to residents for boating (no wake) and fishing. The Crystal Lake community has neighborhood clubhouse with a swimming pool, basketball courts, volleyball courts, and a playground. The clubhouse can be rented by residents for private events. Crystal Lake is in the Oldham County school district and nearby schools include La Grange Elementary, Buckner Elementary, Oldham County Middle School, and Oldham County High School. The neighborhood is conveniently located near stores including Walmart and Kroger, Baptist Health, Downtown La Grange, and restaurants. I-71 is accessible just outside of the neighborhood and Louisville is only a 30 minute drive away. 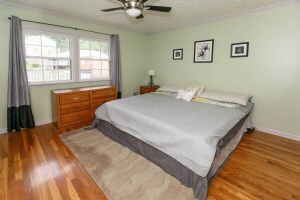 We know you will love the Crystal Lake neighborhood! Bellemeade is a great neighborhood located in Louisville, Ky! The neighborhood is tucked away in a convenient location between Shelbyville Rd and Whipps Mill Rd. Bellemeade is a quiet neighborhood that features green grassy yards, grown trees, and friendly residents. The neighborhood is within a 15 minute drive of several school options for both public and private schools. Nearby JCPS schools include Lowe, Hite, and Bowen Elementary, Crosby, Kammerer, and Barret Middle School, and Eastern, Ballard, and Waggener High School. Some private schools located nearby are Ascension, Christian Academy of Louisville, Sacred Heart Academy, and Trinity High School. Bellemeade is located along Shelbyville Rd which provides easy access to highways, shopping, parks, and plenty of restaurants. Downtown Louisville is just a 20 minute drive from the neighborhood. Bellemeade is a wonderful neighborhood and we know you will love it! 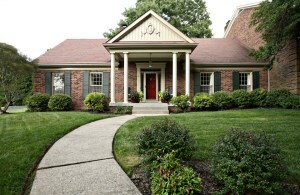 Join the At Home In Louisville Real Estate Group for two open houses this Sunday, August 14th! Visit the model home at Dorsey Pointe, there are only a few units remaining! 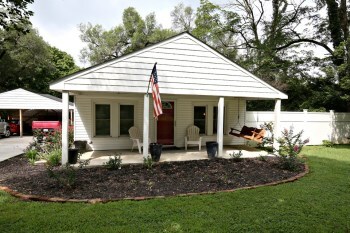 We will also be holding open the lovely 3 bedroom, 3 bath listing at 7510 Manslick Rd. Take a tour with us this Sunday for more information about these homes or call 502-371-1173! 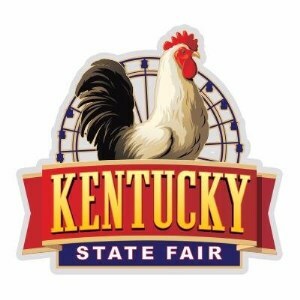 Visit the fair website to purchase tickets or for any additional information about the 2016 Kentucky State Fair. For more information about things to do in Louisville or to discuss Louisville Real Estate, call 502-371-1173. Join our team this Sunday August 7th from 2-4 at two wonderful homes for sale in Louisville! Take a tour of the lovely model home at Dorsey Pointe. We also welcome you to join us at our lovely new listing in Hunting Creek in Prospect! You'll love the immaculate interior & quiet cul-de-sac location! Call 502-371-1173 for more information about these homes or attend the Open Houses this Sunday! Directions: US 42 to Hunting Creek Dr, Follow Entrance to Roundabout and turn L on Westover Dr, L to Autumn Hill Ct.
7510 Manslick Rd Louisville Ky 40214 is a lovely three Bedroom, two and a half Bath Ranch! The home opens to a Living Room with a fireplace, bay window, natural lighting, and hardwood flooring that flows throughout the Dining Room, Kitchen, and Bedrooms. The Formal Dining Room features crown molding, accessess the back deck, and is connected to the Kitchen by a pass through window and decorative columned doorway. 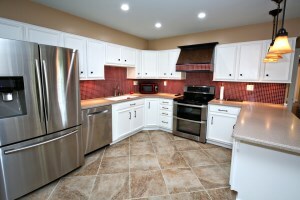 The Eat In Kitchen includes plenty of cabinet space and a tile backsplash. 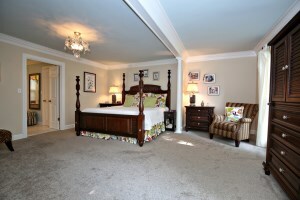 The Master Bedroom of 7510 Manslick Rd Louisville Ky 40214 has crown molding and a Master Bath with a tub/shower combo. Completing the main level are two more Bedrooms and a Full Bath. The walk out Basement features a wonderful Recreation Room, spacious Family Room with a brick fireplace, a Half Bath, and Laundry. The back yard includes a full wood fence, patio, and a relaxing deck with a gazebo. The two and a half car garage is accessable at the back of the home. Some updates to the home include lighting, flooring, toilets in Math Bath and Basement, and double water filtration system. 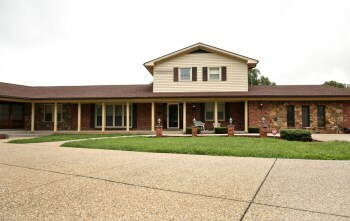 For more information about this home in Louisville, call 502-371-1173. 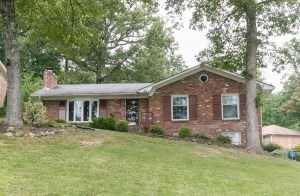 17 Autumn Hill Ct Prospect Ky 40059 is a beautiful three Bedroom, two and a half Bath brick home in Hunting Creek located on a quiet cul-de-sac! 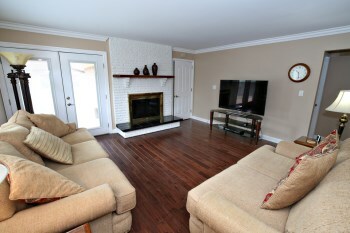 The home opens with a lovely Entry Foyer with hardwood flooring and wainscoting. The good sized Living Room is complete with hardwood flooring, fireplace, recessed lighting, crown molding, bay window, and built in book shelves. The Florida Room features tiled flooring and a ceiling fan and accesses the back patio. The home has a spacious gourmet Kitchen with tile flooring, tile back splash, dining area with a windowed extension, and stainless appliances. 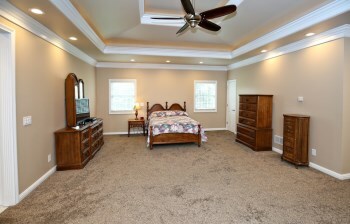 The Master Bedroom is large and has a Master Bath with a dual vanity, plenty of cabinetry, and a glass walk in shower. The first floor is completed with a Half Bath and Laundry. 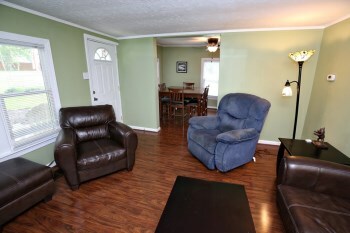 The second floor of 17 Autumn Hill Ct Prospect Ky 40059 offers two good sized Bedrooms and a Full Bath. The Basement has a Family Room and great storage space. The back of the home has a wonderful patio, grassy fenced in yard with irrigation, and a three car garage. To schedule a private showing or for any questions about this home, call 502-371-1173.